Our company executes various assembling services for all types of furniture, including the ones you have purchased for the room of your children. If you have decided to put a bunk bed on which your kids can sleep every night, we have qualified technicians who can come to your home and assemble the parts of your newly bought furniture. 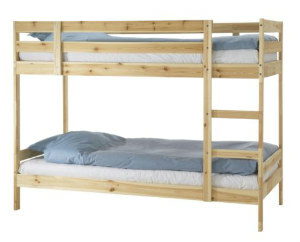 The working process will take no more than one-two hours, depending on the complexity and type of the bunk bed model. You can contact our company for the execution of the assembling procedures during every day of the week and we will send you a group of our most competent specialists who will be at your door within a couple of hours. Preparation of the tools – Our employees will come completely equipped with a set of all necessary instruments they might need for the job, so you won’t have to provide them with anything. Checking of the parts of the furniture – Our technicians will take out the parts from the boxes and will distribute them. They will carefully look every item over to make sure that none of them is damaged or missing. Connecting of the rails to the basic headboards – They will start the assembling process by attaching the rails to the headboards of the bunk bed. Assembling of the two bunks and connecting them – After everything is properly connected, the specialists of our company will put together the two separate bunks and will later put the one on top of the other. Assembling and attaching of the ladder – Next comes the putting together of the parts of the ladder which will lead to the upper bed and its connecting to the whole construction. Attaching of the front rails and the slats – Your bunk bed will be completely ready after our technicians connect the last front rails and then put on the slats for the mattresses. You can be certain that the bunk bed on which your kids will be sleeping are perfectly assembled because our specialist will test the strength of the construction before leaving.